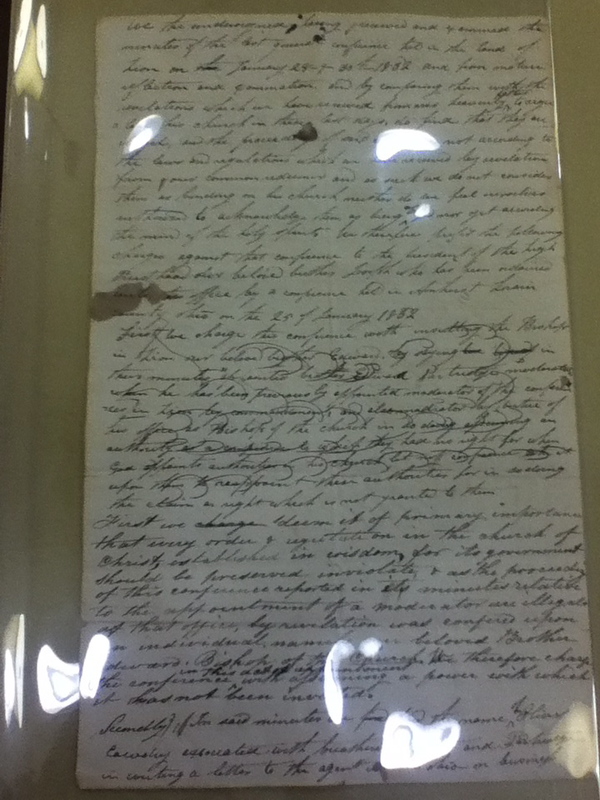 On Monday I attended a launch event at the Church History Library for the second Documents volume of the Joseph Smith Papers. We were given a brief introductory presentation from historians and production editors who worked on the project. Documents Volume 2 covers the time period from July 1831 to January 1833. Three themes emerge through the documents covering this period of time. The first document is a revelation from July 20, 1831, which later became canonized as Doctrine and Covenants Section 57. It identified the land of Missouri as the land of Zion. This set the stage for the first theme of tension between the leadership in Missouri and Ohio, as well as the pedestrian difficulty of dealing with logistical issues of land acquisition and settlement. The last natural theme that emerges from the documents covered by this time period is the development of our church’s theology and the clarification of the orders of the priesthood. We have the revelations that became Sections 76, 84 and 88. I love that this volume gives context for the these revelations. This immersion into the time and context is, for me, a far more satisfying way of studying the Doctrine and Covenants and Church history than the topical approach of the current Gospel Doctrine lessons. At the launch event, we were able to see a few of the documents that were included in the volume, complete with folds, smudges and signatures of early church leaders. We got a glimpse of the vast amount of research that went into creating this book: reconstructing historical contexts, adding the names of women to the record to acknowledge the role they played even though the source documents only list the male heads of households, textual analysis, and even the use of x-ray fluorescence in forensic analysis to determine that some documents signed by multiple people had been signed in different inks, indicating that they were presented to multiple groups in different locations for approval. This same forensic analysis was used to determine that one of the revelations, dated January 5, 1834, was in fact from 1833 because the date (January 5), the year, and the body of the revelation are all in different inks. This particular document may be one of the few original revelation transcripts that have survived. Charges against Missouri Conference Preferred to Joseph Smith, circa March 1832. For a better image, see pages 226 and 227. 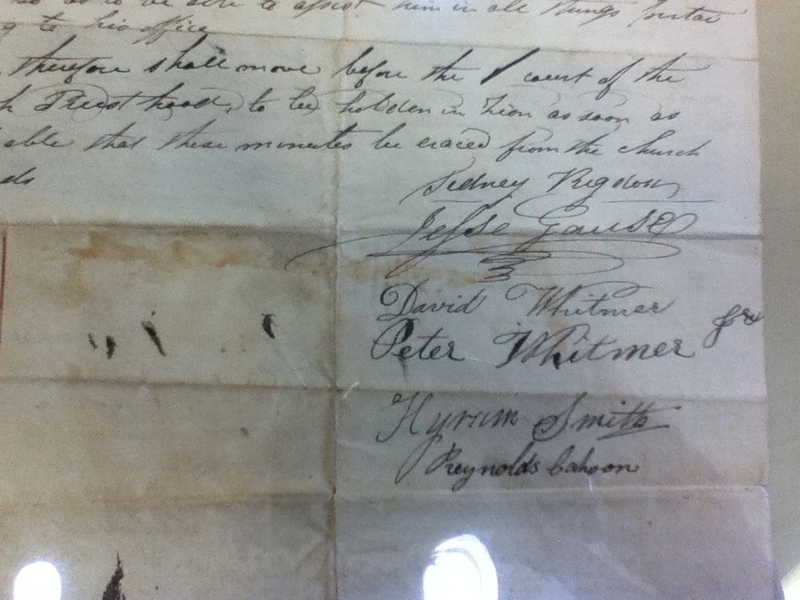 After Peter Whitmer signed this, the paper was folded–note the ink smudges opposite his signature–and then transported for Hyrum Smith and Reynolds Cahoon in a different ink. These volumes are intended for scholars, but anyone with an serious interest in that turbulent time of restoration will be amply rewarded for the effort they put into reading these books. Already, the research done to create this work is having an influence on the Church as a whole in the form of the new section headings for the 2013 edition of the Doctrine and Covenants. This research will have an effect on future curriculum. 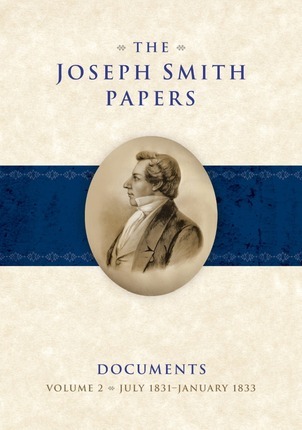 For those of us who are interested, but lack shelf space, the Joseph Smith Papers has its own website, with high resolution images of the documents, transcriptions, historical introductions and source notes, just as are contained within the paper volume. As an example, you can see the letter from Joseph to Emma on October 13, 1832 here. So go, spend some time playing at the Joseph Smith Papers site. Check out the different accounts of the First Vision. This is an excellent opportunity to embrace our history, to learn it and love it. 1. I have loved footnotes ever since I read The History of the Decline and Fall of the Roman Empire in middle school. I love footnotes. Footnotes may be dry and informative, but they often contain the best stories, tangential little nuggets of information that don’t fit the overall narrative or argument of the text, but are nonetheless too delightful for the author to omit and the reader to pass over. I think the footnotes were the only reason I was able to finish reading Gibbon. But I was terribly frustrated when they were in Latin or Greek and thus completely unintelligible to me. Because of THOTDAFOTRE can trace my desire to learn Greek back to my 7th grade summer. It’s only taken me 20-something years to get around to it, but with a couple of years of Attic grammar, The Anabasis and Iliad under my belt, I think I could go back and tackle Gibbon’s footnotes again. Thanks for the notice! And amen on the footnotes. Yes, the JSPP volumes are a great resource and the website as well. But also a bit intimidating — ten or so volumes (projected), different series, large size format, and so forth. I feel like I need some sort of plan to attack the JSPP rather than just reading a volume. Hurray for JSPP! Current estimates are there will be 24 volumes. Don’t be intimidated, Dave, just jump in. Thanks for this explanation of Docs 2, Rachel! Another Amen on footnotes. Dave, it is intimidating, which is why I had hesitated to get any of the books. But now that I have one, I am really excited about it. I can dive in my volume and see what there is to find, but I don’t feel like I have to commit to buying everything, and I’m not a scholar looking for anything in particular. Thank you for the update. This is neat.